But in the present day, Peach, is simply working in the cafe at the refurbished convent, unaware of the layers of family history surrounding her there. Their separate stories traverse the hundred-year history of the Abbotsford Convent and explosively intersect as the past comes to claim its dues. This is a book that I have had sitting on my reading pile for a while, but I wanted to wait and read it when I had no other distractions, so that I could just enjoy it. Maureen McCarthy has a great way with relationships, both within families and friendships. Her characters are often flawed, and that ‘s what makes them believable. The book is set in and around the Abbotsford Convent following the lives of 3 women who all have a connection to the place, and a connection with each other. The story starts with Sadie in 1915, although her part of the story is brief, who had her daughter taken away from her with the claim that she was an unfit Mother. Her daughter was Ellen, and we catch up with her in 1926, she has grown up at the convent. In 1964, we meet Cecelia (Ellen’s daughter) who is 19 and one of seven postulants, ready to take her vows as a Bride of Christ. In the present day we meet Peach (Perpetua), a young university student who gets a summer job working at the café at the convent, which is now a thriving community for artists. Peach and Cecilia are the main characters, and as we read we find out the connection between the two. Cecelia’s story begins when she takes her vows, and then it jumps to Cecilia in present day, and then back to different, important, times in her life. Peach’s story involves what is going on in her life in the present day, as well as her journey to find out where she came from. While this story is fiction, there are notes at the back of the book where the author tells of the inspiration to write this book. Her own mother grew up at the convent from the age of three, even though her father lived close by. 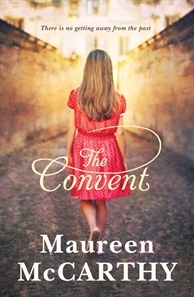 This idea started 21 years ago, but it wasn’t until the death of her mother that Maureen felt it was acceptable to delve into her life, and the history of the convent, to tell this story. For me this book made me think about my own family and its history. While there may not be an iconic landmark like the convent in my past, this story makes you think about all of the lives that came before yours, and how the decisions of others, no matter how small, have lead us to be where we are today. I think this book had broad marketing in both the teenage and adults worlds. I am reading it from the teenage point of view, but it most definitely will appeal to adult readers. Maureen McCarthy has a great way of writing about relationships, both within families and friendships. As I was reading it I had flashes from the mini series Brides of Christ which was aired on TV in Australia in the early 90’s. That two looked at the lives of women, starting in the 60’s and their ties with the church and the changes the church went through at this time. Here is a link http://www.abbotsfordconvent.com.au/ to the Abbotsford Convent, for anyone interested in seeing what goes on there today, and see below for a short video on the history of the convent. I've had this on my to TBR pile for while...the time hasn't been right for it yet...maybe my summer holiday read?